Samuel Spencer October 12, 2010 Comment Now! School is stress. The two go hand in hand. All students have different ways to cope. Some tackle their problems head-on and get their schoolwork finished as soon as they receive it. Some choose to binge drink until they can't see anymore to forget about all the things they're stressed about. Personally, I prefer using a car. 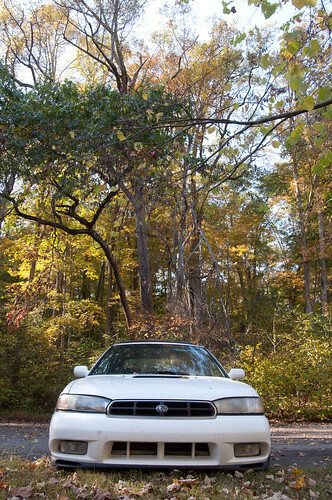 Since mine is garaged up at home, I rode along in my good friend's '97 Subaru Legacy 2.5 GT. At about 11 a.m. on a Saturday, we decided a trip was in order. My friend had always told me about a place about an hour east of Cincinnati called Fort Hill. We decided that it was a great day to head there, and got going. Twenty dollars of gasoline and a gallon of water later we were headed east on my favorite road. 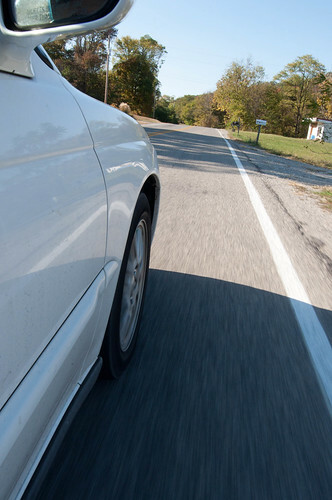 U.S. Route 50 is sometimes referred to as the "backbone of America." It spans over 3,000 miles between Sacramento, California and Ocean City, Maryland. It passes straight through my hometown in Ohio. Every time I drive on it I can't help but amaze myself with the fact that I am on a road that one way goes to the Pacific, and the other way to the Atlantic. On this Saturday we would head towards the Atlantic. We chose the perfect day. It was a sunny autumn day that was uncannily warm for fall in Ohio. The landscape looked as if someone had flicked red and orange paintbrushes at it. Every now and then the sun would catch an orange maple tree and cause it to glow like a bonfire. All four windows were down, and the album we were listening to (The Walkmen - Everyone Who Pretended To Like Me Now Gone) was being drowned out by the massaging sounds of air rushing by. Slowly the smell shifted from smog and exhaust to cow pies and dried leaves. With the world flying by, re-evaluating your life becomes easier. Stress slowly begins to dissolve into understanding. A paper or other homework assignment flutters away with all the other miscellaneous thoughts, and your eyes are stimulated constantly by new sights. And just when you're about to reach nirvana, something alongside the road will wake you up. 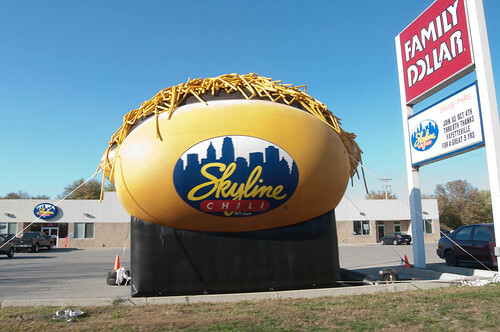 If you don't know what that hideous inflatable is, I'll explain. It is a cheese coney. You take a mushy hot dog, put it in a little bun and garnish it with Cincinnati-style chili, onions, mustard and cheese. It was a wonderful reminder of the world we sometimes end up trapped in. Fast food, drive-thrus, traffic jams, automated phone machines... etc. Needless to say, it only made us want to get out even faster. Another thing you should know about the Cincinnati area: it's in a big damn valley. Whenever you have a great view of the city, you can see how the horizon is perfectly flat all around you. You can thank glaciers for that. Almost all the land is flat unless there is a valley cut by some stream or river. Normally, when you're leaving Cincinnati you go up and out of the valley until you reach the flat plains. Things get really boring and uneventful by that point. Somewhere in the middle of all that flatness is Columbus. Thankfully, we were heading east towards the Appalachian mountains. Those are hills, not valleys. Still, nothing really prepares you for the first time you see them in Ohio. "WHY DID NO ONE EVER TELL ME THERE WERE MOUNTAINS IN OHIO?!?!?!" is what I ended up shouting when suddenly the horizon had acne. We were approaching the very outer fringe of Appalachia. They weren't mountains by comparison to the Rockies, but these hills sure did look like mountains compared to the rest of Ohio. We had entered a land where the Amish still live. A land where there are people that have never associated themselves with technology. A land where iPad sounds more like feminine sanitation. Good luck finding a yuppie driving their BMW way too aggressively out here. This is the land of pickup trucks. I was starting to not miss college. I was also starting to wish I was driving as we got off of Route 50 and turned on to a much more windy road heading to Fort Hill. We arrived at Fort Hill already feeling refreshed. It was easier to breathe since we were both used to smoggy Cincinnati. The old Subaru had done well, hardly using a third of the $20 worth of gasoline we fed it. It got to rest while we got to hiking. Our first leg of the hike was almost all uphill. Huffing and puffing, I started to get annoyed with all the gnats flying into my eyes and the sweat dripping off my forehead. Like all great struggles, this uphill battle did come with its rewards. What a view. You can see a hill just like the one we climbed sticking out above the flat Ohio horizon. This was worth getting out of bed for. This was something I had never knew existed in my life, and just deciding to go for a drive brought us to this fantastic place. 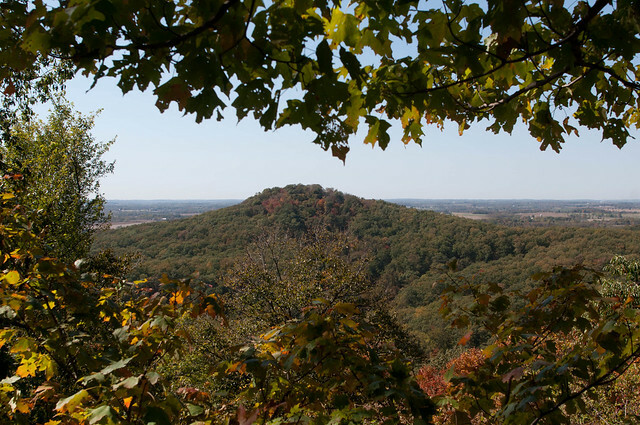 Great views from a hill aren't all Fort Hill has to offer. 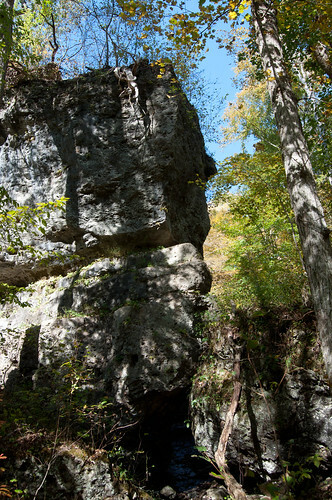 On the other side of the "mountain" there is a gorge full of monolithic cliffs. On the way to this gorge we stopped to understand what was happening around us. After an airplane flew out of earshot we were left with no noises made by human beings whatsoever. No planes, cars, air conditioners, buses, boats, McDonald's, Wal-Mart, or anything. Just the sound of the breeze. Peace had finally come to say hello. Along the gorge there were plenty of cliffs to perch on and reflect upon life. Troubles unwound, and school began to seem like just another chapter in my life's story instead of a roadblock. Happiness stopped in for a visit. That is the magic of the road trip. You don't have to blast down a freeway at light speed to another college campus to party hard in unfamiliar surroundings. Chances are, that will just waste money and you will end up more stressed than when you started. You don't have to drive fifteen hours to the coast to be amazed. Sometimes, the things worth driving to are right around the corner. Sometimes, the road itself is the road trip. Of course, this cant be an official College Car Guide post without some praise towards the Subaru that made this trip possible. That specific one has traveled nearly 200,000 miles in its lifetime and not once did it hesitate to lasso in the horizon. It is another testament to the durability that the Japanese automaker has become notorious for. I can't thank it enough for the relaxation it made possible.